There’s a priest who I often hear who has a liturgical style that, shall we say, does not suit me. When he randomly shouts out “The Lord be with You!” because he’s forgotten where we are in the mass, I often shake my head rather than respond. That’s pretty jerky, but I console myself by the fact that I’m not going home and writing long ranty posts about all the things I don’t like about his preaching and presiding. I have written these posts over and over in my head. I am sure that I am right about all of these things. It feels SO GOOD to complain about it on the way home because it is evidence of how educated and particular and discerning and right I am! But I do whatever is the digital version of biting my tongue, because even though I am that sort of person, I don’t want to be. Often I tease one of the choirs I direct that they make me like songs I don’t like. There are some pieces I am just not interested in singing or hearing ever again. But when I go in with that attitude, it’s harder to leave myself open to God working through music and through people. Sometimes God works in ways we don’t approve of. This is why I don’t understand folks who spill tons of ink over how hideous everything liturgical is. If you don’t like it, don’t do it, but consistently focusing on the negative only ensures that you will never be happy. 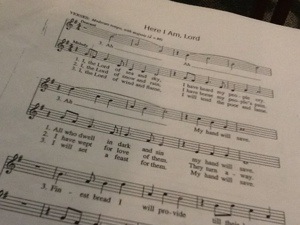 Today we worked on ”Here I Am, Lord”. Some people don’t like that song, some people rant about it at length and scream about how bad it is and generally wear me out with their hatred of a song that may not be Chopin, but which gives people joy. Even though it’s not high art, I was moved today by the sound of lovely people singing it. That movement of my heart was prayer and gift, and I would have missed it if I gave all my energy to being superior and negative. I’ll keep trying not to get mad when the sacraments don’t go how I want. I’ll keep trying to stay open to the work of God, even when I’m disappointed, even when I’m unhappy, even when I feel superior and smarter and more educated and advanced. And even if I can’t always stay as open to joy and grace as I want to be, I’ll try not to rant about all the things that bother me. Yep. Whenever “On Eagle’s wings” is being sung, I try to remind myself that someone thought it was the best they could give when they wrote it, even though I really despise the song. Chris Walker tells the story of a similar event that occurred when he directed music at a British cathedral. People wanted a particular song. “We will never, ever sing that piece in MY cathedral,” went his mantra for several years until his bishop insisted on that piece of music for an event. He had no choice but to comply. As the cantor announced the hymn, a little old woman in the pew picked up her copy of her worship aid, looked at the piece of music, closed her hymnal and set it back in the pew rack. She crossed her arms over her chest, closed her eyes and sang the entire piece from memory — all four verses. Clearly the piece was a prayer for the woman. Chris never again banned any piece of music from his library if it met the criteria of the three judgments. I enjoyed this post. You’re learning to be a woman of grace and prayer far earlier than I did, Margaret! What a gift to the Church you are. Thank you. Great story! And thanks for the encouragement, though I still have an awfully long way to go. While I do not entirely disagree with your post, I take issue with individual piety ruling excessively the communal prayer. I have this same issue all the time and I find myself also in the above named quandary. But surely in time, I have come to realize that the liturgy is not something we assemble every weekend, but is “given” to us to pray. We have the music given to us in the propers and in that obedience I find great solace and great prayer. The problem with the last forty years is that the liturgy is a blank canvas that “we” draw upon. That starts the liturgy from a horizontal dimension. Starting from the other way around frees us in ways that the four hymn sandwich just does not hold up. One step at a time…. But we have to make these transitions slow and recognize where people are. Change is slow and steady.